Moss & Barnett is pleased to announce that it has launched a new firm-wide initiative, M&B Cares. Moss & Barnett employees have participated in a wide range of civic, charitable, and other community service organizations for many years. To encourage and recognize volunteerism, the firm will be organizing quarterly initiatives. Employees will be encouraged to submit nominations for organizations and activities for service by M&B Cares. The committee members are attorney Jana Aune Deach, paralegal Shelly Doerr, accounting clerk Nick Tautges, and attorney Jeff Waldron. “We are very grateful for our employees who endeavor to improve the quality of life in our communities and are thankful to our firm for assisting with those efforts by providing its support and recognition to them,” said Jana Aune Deach, who will serve as the chair of M&B Cares and is also a director on Moss & Barnett’s board of directors. 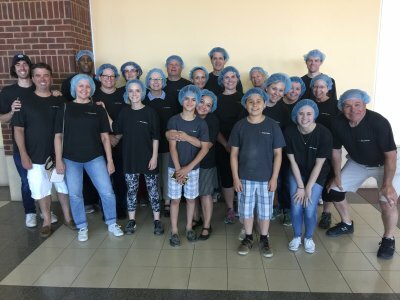 Our first M&B Cares initiative took place on June 4, 2017, when Moss & Barnett employees, family members, and friends participated in the Feed My Starving Children’s mobile packing event, LOVE SOMALIA, held at the St. Paul River Centre. The group filled 46 boxes of food that will provide 9,936 meals (the event produced a total of 645,568 meals).